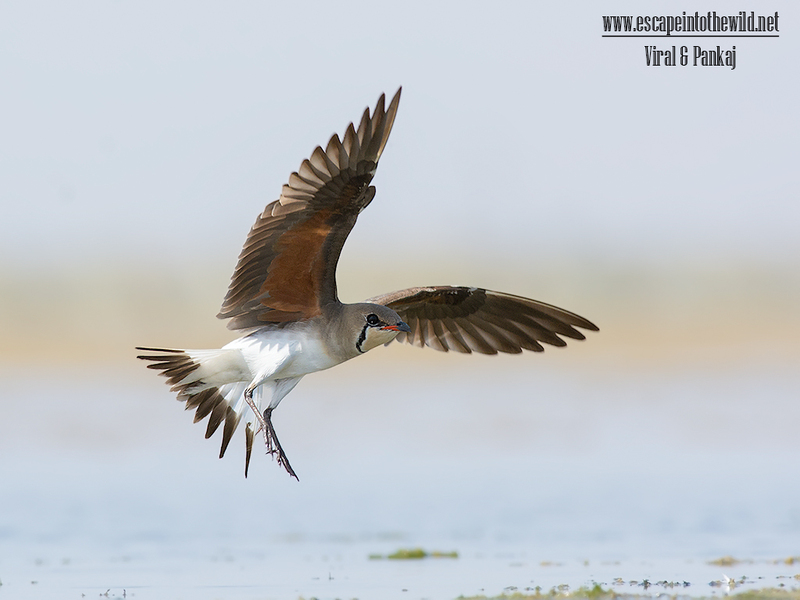 We observed Collared Pratincole in Nal Sarovar from last three years. They came here to do nesting. We went to Nal Sarovar Bird Sanctuary for breeding plumage, on 14/04/16 story posted at Black-tailed Godwit. When we reach on island, I saw a group of the Collared Pratincole. After some time I noticed that, they were coming to drink water at regular intervals. Therefore, I decide to lie down there and wait for them. After wait of few minutes, flock of Collared Pratincole came to drink water and I got desired shots. We saw many people on internet confused about the Collared Pratincole and Oriental Pratincole. We can differentiate them by the length of tail and end of wing in resting position. In Collared Pratincole tail tip reaching tips of closed wings while in Oriental Pratincole tail tip falling short of wing tips. The species name pratincola means an inhabitant of meadows, from Latin pratum, prati, "meadow" and incola, "inhabitant", from incolere, "to inhabit".